Salad leaves, apart from lettuces, have been out of favour until fairly recently in the UK. 'Salets' were once commonplace in England & Wales from the late C14th onwards. A mixture of leaves was often served as a side dish. This was particularly popular in spring providing a refreshing break from the root vegetables of winter. Some leaves have strong flavours while others are bland but succulent. The skill lies with the mixture and proportion of the types of leaves. Lamb's Lettuce (Corn Salad): Sow outside April to September, in shallow drills (less than 1") or simply scatter the seed, keep moist to get maximum germination. You can harvest individual leaves or the entire rosette of leaves at 8-leaf stage; plant will regrow from root. Can survive and crop during a mild winter. Mibuna: Long and narrow leaf on an equally long stalk. Spring and autumn sowing advised. Autumn sowing will crop in January to March. Plant will regrow from one cropping. Mustard flavour. Mizuna (Mitsuma): Useful winter crop but grow under cover. Sow mid-May to August outdoors. Plant will regrow from one cropping. Mild mustard flavour. Orach (Mountain Spinach): Attractive purplish-red leaves, will grow to over 3' in fertile ground. An easy plant to grow, tolerant of most soils and conditions, and does very well in the sandy soils of Wem. Reported to do best in partial shade but this is probably because it is a cool weather crop. The leaves are arrow-shaped and produce the best colour when in full sun, in partial shade a mottled appearance ranging from purple to green will develop. An annual that produces large quantities of seed and will self-seed in an area (and other areas!). Dry conditions will bring on seed formation. Seeds are produced on long stalks and covered with papery husks. Useful in a no-dig or forest garden system. Young leaves - salad; older leaves as spinach, may need to remove mid ribs of leaves. Orach does not lose its red colour when cooked. Pak Choi: Sow outside mid-May to August, any reasonable soil as long as well-drained. Resembles a cos lettuce but dark green leaf area with wide white midribs. Water little and often. Can grow as whole plant or 'come & cut again'. Can also be grown in containers.Dwarf varieties are available and many gardeners prefer these for the production of salad leaves because they reckon that they (1) are easier to grow and (2) have a better flavour. Harvest mid-June to November. Reasonably frost-resistant. However gets every brassica pest/disease known and unknown to gardeners but it grows quickly so often escapes the worst. Red Perilla: Needs light, 18°C to germinate. It is a member of the mint family. Very attractive plant with purplish-red crinkly leaves, decorative enough for a flower border. Start in small seed trays under glass in spring, transfer whole mat of plants into open position and thin if needed. Pick leaves as required. Tastes of combination of mint and fennel but some people find it fairly bland. Use to brighten a mixed leaf salad or as a flavouring with fish. 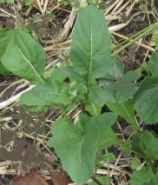 Rocket: long growing season, prone to flea beetle in early part of season, peppery leaf. Wild Rocket - stronger flavour, serrated leaves. If you sow in early summer the plants will have limited cropping potential because they go to seed very quickly. Sorrel (Common Sorrel, Garden Sorrel, Narrow-leaved Dock, Spinach Dock): Perennial plant, used for the oblong leaves often described as heart-shaped or arrow-shapped. Prefers shade. Useful in spring, becomes coarse and bitter later. Tatsoi (Chinese Cabbage): Spoon-shaped, succulent leaves, prone to mildew. Sow in open ground, in drills just short of 1" in depth, from mid-July to October. If you plant too early in the season there is the risk of bolting. Harvest in 6-8 weeks. Can last into early December. Crop individual leaves. Winter Purslane (Claytonia, Miner's Lettuce): Sow outdoors in July and August. Harvest from October to March, picking a few leaves at a time. Individual leaves can be picked; very useful for small families - prevents the lettuce glut and resulting production of large quantities of lettuce soup. Sow a number of varities at regular intervals. Can sow directly (fine tilth better) or transplant though lettuce do prefer not to be disturbed too much. Early and late lettuce will need protection. Slow growth can result in tough leaves. Slugs: biological controls can be very effective. Downy Mildew: white mouldy leaves, often occurs if cold and wet, remove leaves - making sure that plants are not overcrowded will help. Loose leaf can be ready in 6 weeks, others 10-14 weeks. Lettuces (cabbage-form) are ready when they feel firm. Once they start to bolt - eat quickly. Will be crisper and have more flavour if picked in the early morning.